The Extron CrossPoint 300 88 Series is designed to route wideband RGBHV and stereo audio signals. 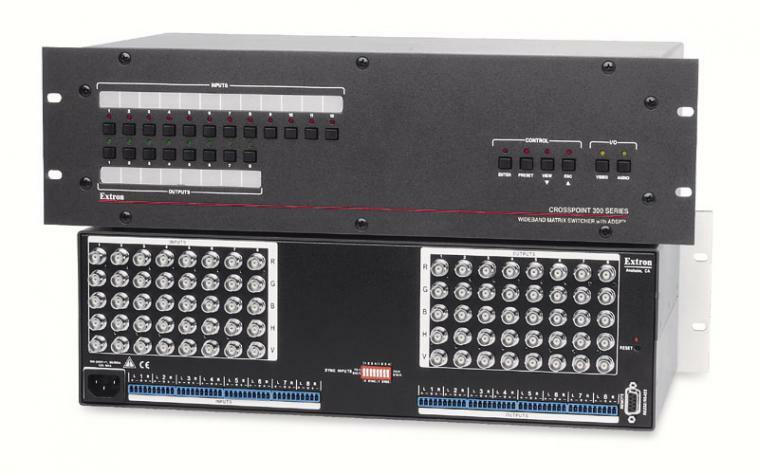 Both 8x8 matrix switchers feature 300 MHz (-3 dB) bandwidth, fully loaded, and are also fully compatible with RGBS, RGsB, HDTV, component video, S-video, and composite video signals. The CrossPoint 300 88 includes Extron's ADSP - Advanced Digital Sync Processing technology, an all-digital process that corrects and restores the sync signal as it passes through the switcher. First, ADSP restores sync to TTL levels, 5.0 V p-p, ensuring that the projector or monitor accurately locks to sync and displays a stable image. Second, ADSP corrects the signal waveform to create sharp rising and falling edges, ensuring a more stable and reliable image in systems with different signal sources or cable lengths. Whether signal losses and distortion are caused by long cable runs, variations in display graphic card outputs, or low sync levels from many laptop computers, ADSP significantly reduces sync related problems, improving signal compatibility with many digital display devices. - Simple Instruction Set. SIS simplifies serial control by utilizing a limited set of easy to read, ASCII command codes. Designed for routing most common high resolution computer-video rates without signal degradation. The CrossPoint 300 Series provides a minimum 300 MHz (-3 dB) of RGB video bandwidth at full performance capability when one input drives all outputs. New Extremely flat response Switcher performance is further enhanced by the extremely flat response in the critical portion of the bandwidth curve, between 0 and 130 MHz. New ADSP - Advanced Digital Sync Processing technology. An exclusive, all digital process that regenerates the sync signal waveform and restores incoming sync level to 5.0 V p-p specifications. This ensures a stable image for improved signal compatibility with any LCD, DLP, plasma, or other digital display device. Compatible with RGBHV, RGBS, RGsB, HDTV, component video, S-video, composite video, and unbalanced/balanced stereo audio CrossPoint 300 Series models switch separate horizontal and vertical sync to ensure proper sync polarity, providing a more stable image. Buffered I/O Each input and output is individually buffered to provide maximum performance and virtually no crosstalk or signal interference between channels. Audio input gain and attenuation Allows users to set the level of gain or attenuation for each audio input channel, eliminating noticeable volume differences when switching between sources. New Audio output volume adjustment and muting Can be set dynamically for each channel through the front panel or serial control, eliminating the need for an audio preamplifier in many system designs. Audio breakaway Provides the capability to break an audio signal away from its corresponding video signal, allowing the audio and video signals from one source to be switched to different destinations. QS-FPC - QuickSwitch Front Panel Controller Provides a discrete button for each input and output, allowing for simple, intuitive operation. Front panel security lockout Prevents unauthorized use when the matrix switcher is installed in an unsecured environment where easy access is not desirable. In lockout mode, a special button combination is required to operate the front panel. Front panel I/O buttons may be easily labeled with any Brother P-touch labeler or included Extron label software Each input can be labeled with name, alphanumeric characters, or color bitmaps for easy and intuitive selection of inputs and outputs. View I/O mode Easily view which inputs and outputs are actively connected. Global presets Frequently used I/O configurations may be saved and recalled either from the QuickSwitch Front Panel Controller or serial control. This time-saving feature allows you to set up I/O configurations and store them in memory for future use. RS-232 and RS-422 control port Using serial commands, the CrossPoint 300 Series can be controlled and configured via the included Windows-based control software, or integrated into third-party control systems. Extron products use the SIS - Simple Instruction Set command protocol, a set of basic ASCII code commands that allow for quick and easy programming. The RS-232 and RS-422 port also makes it easy to install firmware updates. Control software Provides a graphical, drag-and-drop interface for I/O configuration and other customization functions via RS-232 and RS-422 remote control. This software also offers an emulation mode for configuration of an offsite matrix switcher; the I/O configuration may be saved for future downloading to the matrix switcher. Optional remote control Optional X/Y control panels, bus control panels, and keypads provide the flexibility to control a CrossPoint 300 Series matrix switcher from a remote location. 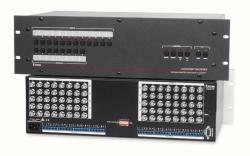 Rack-mountable metal enclosure All CrossPoint 300 Series matrix switchers are housed in 19-inch wide metal enclosures. Highly reliable, energy-efficient internal universal power supply The 100-240 VAC, 50/60 Hz, international power supply provides worldwide power compatibility with high demonstrated reliability.